BENGALURU, India--(BUSINESS WIRE)--L&T Technology Services (NSE: LTTS), a leading global pure play engineering services company, has consolidated its status as a ‘Leader’ in the Zinnov Zones 2018 report across 10 business verticals for the third year in a row. In addition, LTTS has advanced its competencies in 5 new expertise areas for its engineering services. L&T Technology Services Limited (LTTS) is a listed subsidiary of Larsen & Toubro Limited focused on Engineering and R&D (ER&D) services. We offer consultancy, design, development and testing services across the product and process development life cycle. Our customer base includes 52 Fortune 500 companies and 51 of the world’s top ER&D companies, across industrial products, medical devices, transportation, telecom & hi-tech, and the process industries. Headquartered in India, we have over 14,700 employees spread across 17 global design centers, 27 global sales offices and 48 innovation labs as of December 31, 2018. For additional information about L&T Technology Services log on to www.LntTechservices.com. 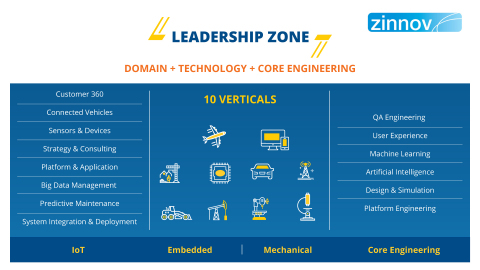 L&T Technology Services strengthens its position as a ‘Leader’ across 15 Engineering Domains in Zinnov Zones 2018.